I’ll be in the US at the end of November and beginning of December for Thanksgiving and the meeting of the American Anthropological Association. 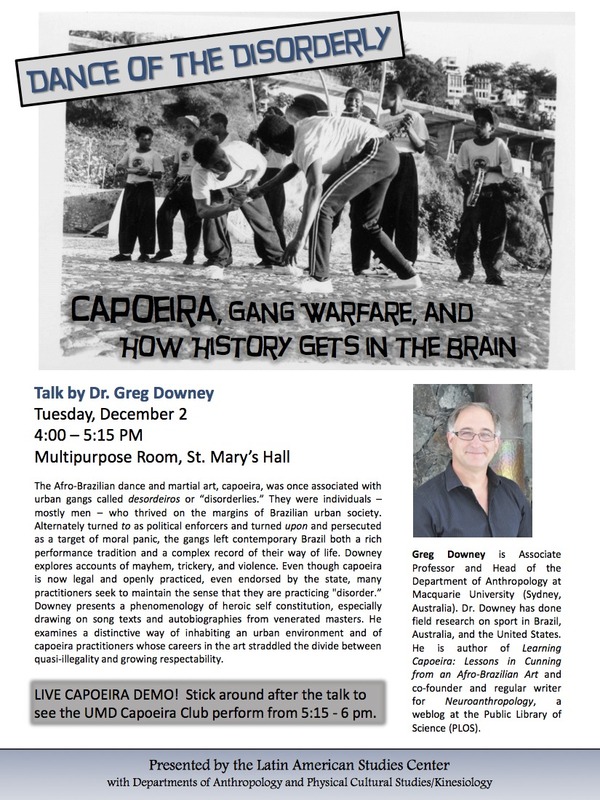 On 2 December, I’ll present a lecture on capoeira: Dance of the Disorderly: Capoeira, gang warfare and how history gets in the brain, in Saint Mary’s Hall at the University of Maryland (4:00-5:15 pm). The flyer for the talk is attached. I’m very lucky to be hosted by the Latin American Studies Center with the Departments of Anthropology and Physical Cultural Studies/Kinesiology, all thanks to the logistical prowess of Assoc. Prof. Laurie Frederik. There will also be a live demonstration after the talk by the UMD Capoeira Club, so who knows what will happen?